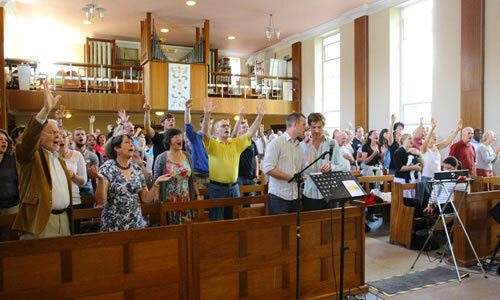 We meet on Sundays at 10.45am at the Dietrich Bonhoeffer Church, 50 Dacres Rd, Forest Hill, London SE23 2NR, EXCEPT for the fourth Sunday of every month when we have an afternoon all-age meeting at 3pm. This is because the German congregation who own the building have their service there that morning. Our Sunday morning meetings are an important part of our church life. They last about 1.5 hours and seek to be friendly and informal – there’s no dress code! We look to be led by the Holy Spirit as we worship God together and encourage people to use their gifts so that everyone is encouraged. There are opportunities to pray for each other or receive prayer ministry when we gather. We regularly share communion, usually once a month. We believe God’s word is active and speaks powerfully into our lives today, so relevant Bible teaching is an important part of our meetings. Each week there are groups for children and young people during the second half of the meeting. The children’s work for under 11s is called Tree Church and has a creche for under 5s, “Seedlings”, and a group for 5-10s, “Evergreens”. There is also a Youth group for under 18s. Meetings end with tea, coffee, cakes and biscuits and plenty of time to chat and build friendships.